The North Sea is part of the Atlantic Ocean, surrounded by the coast lines of Great Britain, Scandinavia, Germany, the Netherlands, Belgium and France. Please click the map for a general overview of its location and surrounding countries. 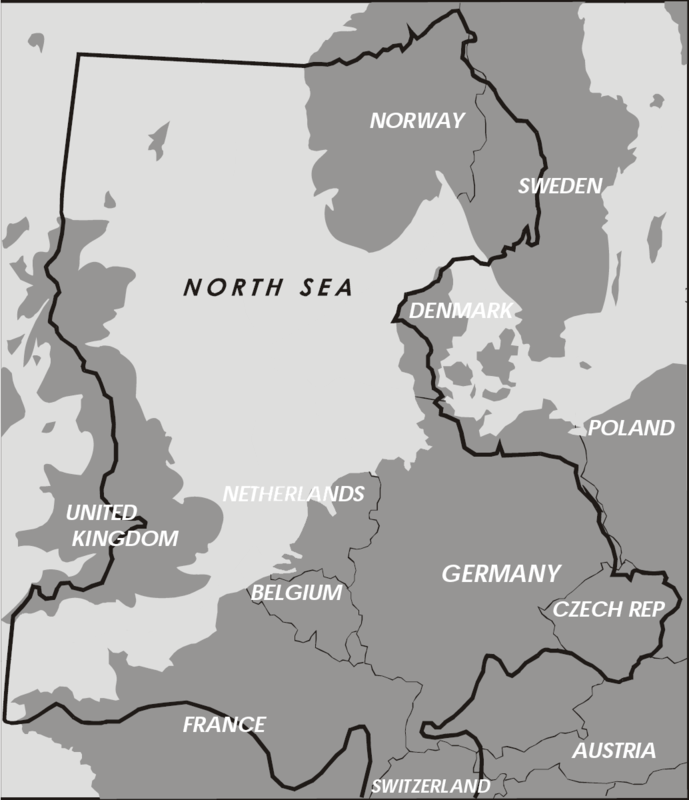 For Germany the North Sea makes up one of its two coast lines: The North Sea in the West, the Baltic Sea in the East. The two coasts are seperated by the country of Denmark and the Northern part of Schleswig-Holstein, one of the 16 German states. 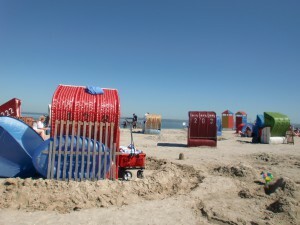 The North Sea is a popular tourist destination for travellers from all over Germany. Popular sports include windsurfing, flying kites, sailing, swimming and of course major sand castle building. The North Sea is popular during the summer months, because the weather is mild, temperatures not as boiling as in the mainland, and full of fresh breezes. The other months are well-liked as well, although the weather conditions may change quite rapidly as in any costal area. After all, you may always go for long walks along the dikes and enjoy the salty air, which is said to be particularly healthy. Many people with respiratory diseases travel to the North Sea for holidays or go to one of the specialized clinics to be treated. Spending a day at the beach (not all beaches are sandy, mind you) usually involves renting one of the roofed wicker beach chairs to protect you from the wind and sun. Germany’s coast of the North Sea is a National Park and the Wadden Sea even a UNESCO World Natural Heritage site. 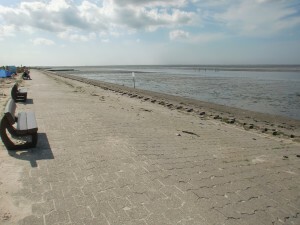 Tides at the Wadden Sea change twice each day. A high tide (Flood) is always followed by water running back into the sea (Ebb). This leaves the ground of the North Sea visible and walkable and even makes it possible to walk from the coast line to one of the smaller islands two miles away when the tide is low. One has to hurry though, of course, to cross in time and should only do so with an experienced tour guide. This process of uncovering the ground and then covering it again with salt water provides the basis for the rich nutrition required by the smaller animals and plants. Fishing is probably the most traditional industry along the North Sea shore lines and still an important economic factor for the region today, next to tourism and other industries that are usually more inland, however. The North Sea has also been a source of energy for the past decades after huge fields of oil and gas were discovered. Oil and gas platforms harvest these sources of combustible energy. 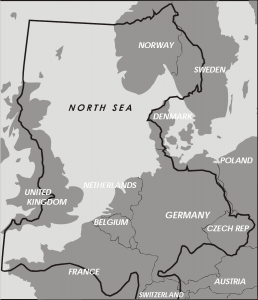 While these natural resources have been important for Great Britain and Norway particularly, they are not so present in the German parts of the North Sea. What has become more and more important over the past years, though, is the North Sea as a powerful source of wind energy. With an expected percentage of 40-50% of Germany’s energy coming from renewable energy sources by 2020, wind power plays an important part. This includes many onshore wind parks and wind mills spread along thecoast as well as huge offshore wind parks further off into the Sea.